Rodney Leer, Brenham Independent School District, USA "CACHEBOX has helped me overcome latency that bandwidth doesn’t solve - caching is the ONLY way to overcome latency in a network." John Day Sales, Pacific Data Systems, Guam (USA) "Appliansys catered to our requirement to cache video, Apple and Microsoft updates and app downloads. This eased the bandwidth requirement..."
As the size of a cache fleet grows, the task of administering it, one server at a time, can quickly become a problem. The solution – CACHEBOXCMC Central Management Console – is a must-have, making your life easier by bulk-managing large CACHEBOX deployments. By connecting securely to all the CACHEBOXes in your fleet, CACHEBOXCMC lets you batch configure, monitor, update, backup and recover them, all from a single browser – hugely reducing the administrative workload, improving deployment quality and increasing control. It also stores data relating to the individual CACHEBOXes – their physical location, other key servers on their networks and contact information – enabling efficient centralised reporting on your CACHEBOX fleet. Monitoring features help you set up configuration policies to control bandwidth usage and network traffic. Whether you’re an education authority, service provider or enterprise, centrally managing your CACHEBOXes avoids the need for expertise on-site at remote locations, saving you time and money – again and again. Full training for central administrators can also be provided remotely, keeping costs as low as possible. CACHEBOXCMC makes it easy to remotely install multiple CACHEBOXes without the need for an expert engineer onsite. Units to be deployed across a large, distributed network can be pre-registered on the CMC, then automatically configured once physically installed onsite. You can import fleet details via CSV for multiple devices simultaneously, saving you the hassle of doing it one at a time. Whether you have 5 CACHEBOXes or 500, you can create custom sets of units in your network. CACHEBOXCMC lets you easily group and tag appliances by geography, model, edition, deployment type etc. This function dramatically cuts administrative workload and saves time. Once you create your own groups and tags, you can perform bulk operations including configuration, maintenance, aggregated reporting and monitoring. 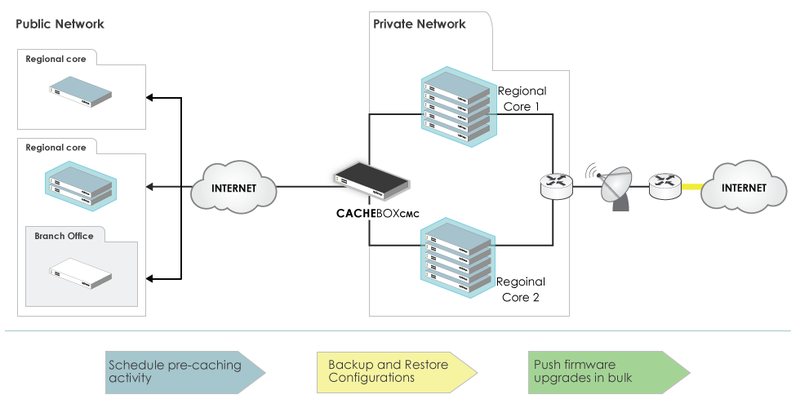 Using CACHEBOXCMC, a number of CACHEBOX functions can be configured centrally and applied to multiple devices simultaneously. Where changes need to be made to an individual unit, as the administrator, you can link directly to the required CACHEBOX’s own interface. CACHEBOXCMC gives you informative, aggregated reporting for your entire fleet or set groups. These reports serve as a powerful insight into your users’ browsing patterns, which in turn gives you much more control over your network. All reports are automated and can be scheduled via email. You can view reports on fleet bandwidth usage, top sites and content types. CACHEBOXCMC supports proactive device “health-checking” constantly polling each CACHEBOX and collating data that reflects its current state. At-a-glance visual warnings let you know of any irregular activity, allowing you to take preventative action. The statistics gathered include environmental factors (such as temperature), network (usage, visibility of the CACHEBOX and other servers such as router and Active Directory) and load (e.g. CPU and disk usage). Status figures and advice can be exported for detailed analysis. One-click upgrades: download the latest firmware just once on the CACHEBOXCMC and push it out to connected CACHEBOXes by group and / or scheduled basis. CACHEBOXCMC performs regular maintenance checks for new firmware and also tracks software versions for your fleet. Automated daily backups can be rotated through weekly and monthly reports. Grupo Alcione needed to switch from MPLS to ADSL lines for network connectivity at each of its 15 sites whilst reducing cost and maintaining control of its network.